Being a traditional strip piecing quilter, I am not. The only quilt piecing I do is paper piecing or foundational piecing. I find it easy, goes smoothly and also goes together fairly fast. I completed this quilt in about 3 months, for the African-American quilt show in Flint MI last September. Since I am the organist and choir director for an African-American church and also a quilter, the ladies ask me to enter a quilt every year. 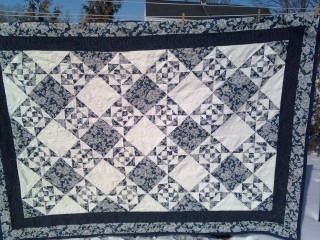 This quilt was entered in 2008, and shortly after, I gave it to my grand daughter so that she could keep warm this winter. She has the coldest room in her home. Morgin says she will never part with it.